On May 7, 1942 I. Russel Sorgi, a photographer for the Buffalo Courier Express in Buffalo, New York was on his way back to the office from an assignment. Having taken a different route than usual, Sorgi was passed by police cars when he decided to follow them. The cars pulled up to the Genesee Hotel at 530 Main Street where Russell Sorgi noticed a woman “sitting on a ledge outside an eighth-floor window” on the corner of Gennesee and Pearl Street. Ms. Miller checked into the hotel under the name “M. Miller” and claimed she was from Chicago. She immediately went into the hotel’s communal women’s restroom, locked the door, and stepped out onto the ledge through the window. 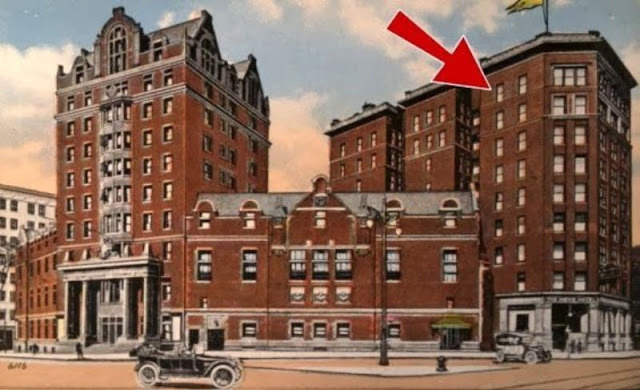 Mary Miller was a resident of Buffalo who lived with her sister and had checked into the Genesee Hotel after telling her sister she was traveling to Indiana to visit relatives. Although there is not much information on Mary Miller available, what is known is that her sister was absolutely shocked by Mary’s suicide. The photo, which was titled “The Despondent Divorcee,” has no basis in fact as Mary Miller was not, nor was she ever, married. What makes her case so disturbing is that there is no known motive behind the suicide, no note was ever discovered and she waved to the crowd immediately before ending her life. In addition to the Buffalo Courier Express, the photo was published the next day in the May 8, 1942 edition of the New York Times and later, LIFE magazine. 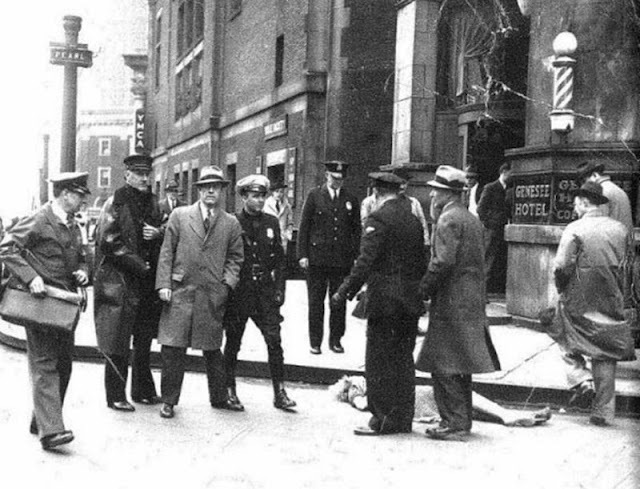 In the photo, a police woman can be seen entering the hotel in what was most likely an attempt to reach Mary Miller before she could kill herself; perhaps seeing the officer enter the building prompted Mary to jump when she did, before she could be deterred. 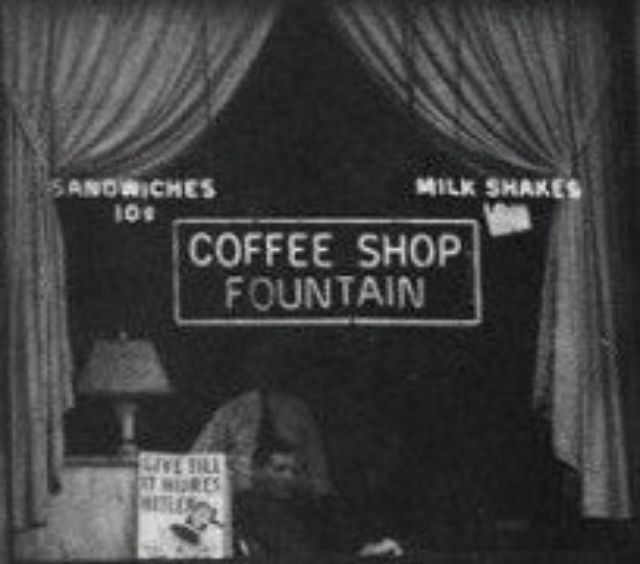 The sign hanging from the side of the building advertises room rates at the Genese Hotel as “$1.00 and up” per night (but you have to share a bathroom, of course) and sandwiches at the coffee shop downstairs only cost customers 10 cents in 1942. The Genesee Hotel was erected in 1882, but this historic building has since been demolished. 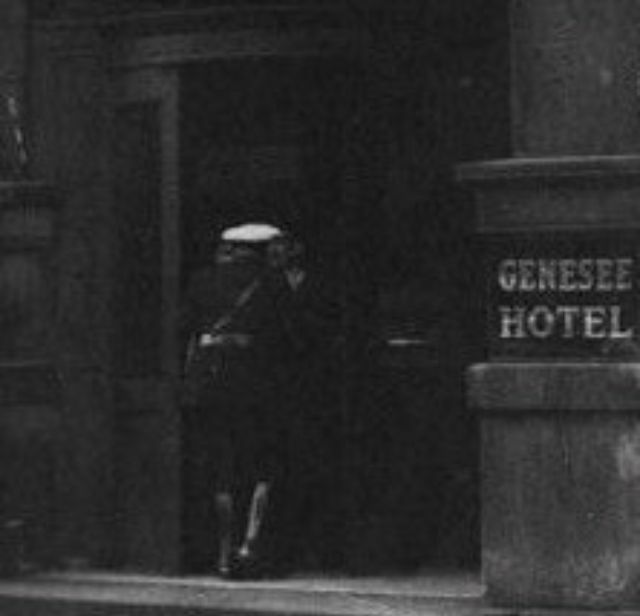 The famous photo, generally referred to as “The Despondent Divorcee” but more correctly referred to as “The Genesee Hotel Suicide” was used in a psychological study. It was found that 96% of participants in the study did not notice Mary Miller falling to her death upon first examination of the photo. Sorgi was probably using a Graflex Speed Graphic camera, which in 1942 was used almost universally for newspaper photography. This was an SLR that used 5″ by 4″ sheet film, which is where the amazing detail in this photo comes from. Whereas with a 35mm SLR one could snap off up to 36 images before reloading, Sorgi had to remove each exposed slide and reload the camera before he could make his next photograph. His coolness is evident: He had to wait for just the right instant to capture this shot, or he would have been too busy reloading the camera. He must have seen his two “establishing shots” as a huge risk. 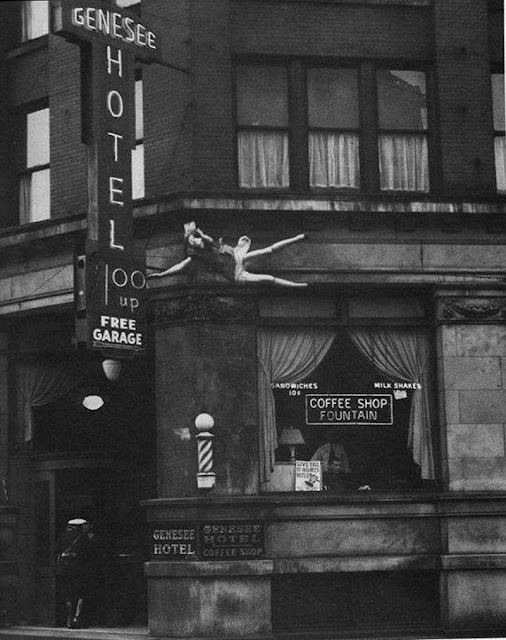 Postcard of the Genesee Hotel showing the window from which Mary Miller jumped.